Neven, feel free to move if there is a better location, please. I have always appreciated your enthusiastic input on the forum, and I don't won't to go against you for the sake of arguing alone, but I don't see how any amount of snow and the associated increased albedo could mathematically cancel out the amount of heat energy the Earth is absorbing, much less cause a reversal. Most of the heat is being absorbed in the oceans, which cover vastly more sq. km's than land area, and especially land area that is even subject to snow cover at all. I don't have the info to do the math, but I am sure there are some on here that do. Thank you for starting a new thread! I have no idea re: math into this, either, and I could most definitely be wrong. But, at the end of the day, the chief input re: heat on Earth is the sun. If more of the Earth's surface is reflecting more sunlight back into space (and dissipating heat more readily at nighttime as well), I would think that actually has a *larger* impact than changes in GHGs, which alter the distribution of heat retained by the Earth, not the overall amount of heat it actually takes in. The only things that can alter the latter are A) changes in the sun's output or B) changes in the Earth's reflectance/albedo. Given this, I suspect that we have vastly underestimated albedo's impact on overall global climate. Even if the amount of land that is snowcovered in a given year only increases by 10%, that is an absolutely *huge* amount of solar energy (~3% of planetary total!) that is now being deflected back into space. If someone can provide more concrete numbers or throw my ideas into the garbage can either would be appreciated. Of course, we currently are dealing with shrinking amounts of Arctic sea ice, which also has significant impacts re: albedo and most certainly is a huge contribution to overall warming and the seemingly runaway melt we are now seeing up north. To my eyes, this will continue until there is almost no ice up north, and the Arctic will continue taking up more and more heat until there is enough snow on the continents to counteract the differential. The key thing to note here is that though the Earth may have vastly more ocean than land, the impact of losing the ice up north can indeed be more than countered by expansion of snowpack over land in terms of raw area (e.g., we currently have 13.5M KM2 of icepack; it is certainly not inconceivable that if this dropped another 50% during wintertime, that the 6.75M KM2 differential is more than made up for by increased extent and duration of overland snows). Consider that the Arctic bears the brunt of solar input during summer -- so the albedo impact of its losses are most felt during this time when it takes in energy -- but areas lower in latitude deal with much more solar energy earlier and later in the year (especially the Himalayas). That means that while the loss of Arctic icepack albedo is very detrimental during summer, it is somewhat less relevant to total global energy uptake vs. mid-upper latitude snowfall changes, which matter much more in spring/fall. Final note: the increase in snowfall also has implications for the oceans/sea ice. It seems to my eyes that the only areas of sea ice that are holding steady or increasing on an annual basis are those in the upper-mid-latitudes (Hudson Bay, Labrador Sea, Sea of Okhotsk). This adds a relatively minimal amount of sea ice, but this too contributes to the reflectance of solar energy back into space, in areas that receive much more sunlight than the Arctic much earlier in the year. Of course, they still melt out, but the contribution is not insignificant. Thanks TT for starting this thread. I like some of BBR's ideas and would like to hear more without the constant reminder that the discussion is "off topic". I appreciate that you are willing to discuss this without being dogmatic about the matter, and hopefully some others can add to the discussion, as well. Regarding this topic, on the one hand the extra albedo from the snow would reflect more short wave radiation from sunlight, and therefore there would be less long wave radiation from land trying to escape only to be trapped by ghg's. On the other hand the added moisture in the air would absorb more shortwave radiation to begin with. This effect is now believed to be the biggest problem with warming over the long term. So again, it seems the warming is one way, at least as far as I can tell. Hmm. I wonder re: last point (added moisture in air). Wouldn't snowfall generally lead to colder temperatures (by way of reflectance), at least for the duration of the snowpack's existence in sub-freezing temperatures? Perhaps while it is snowing there would be more absorbing of radiation, but after it is on the ground, I would think that all else being equal, a snow-covered landmass at sub-freezing temps normally has *drier* air than non-snow-covered land in above-freezing temps for the locations we are discussing. Obviously Antarctica is a bit of a dramatic comparison, but it is the world's driest continent despite its entirety being snow-covered. Perhaps I am wrong here, but I think the impact on albedo outweighs any impacts re: moisture availability in the air, and with snowpack allowing colder temperatures, that would generally indicate that areas covered by snow experience drier airmasses. Of course we see intervals of moisture (and either building of snowpack, or its destruction due to accompanied warmth), but with precipitation seemingly coming in longer intervals of heavier durations, this would actually counter the idea that more moisture is generally available (instead, things are generally drier, but the sporadic instances of precipitation when they *do* occur are heavier). I am rambling a bit but hopefully that makes some sense. Finally, I believe that combining these albedo feedbacks with the rapid degradation of both Greenland and Antarctic ice sheets could perfectly explain why we see periods of cooling onset so rapidly -- it takes a while to warm to a certain point, but thereafter the Earth rapidly flips into an ice age due to how these feedbacks work (i.e. Younger Dryas). Besides the tentative fact that an open Arctic results in ++NHEM snowfall, you have to lump on the cumulative impacts of AMOC slowdown/shutdown as well as the impacts of melt in the Southern Ocean. These amplify the albedo feedbacks further. The air in the Arctic was dry in the past, but not anymore. There seems to be so much moisture now that it cannot be contained. I am no expert on that subject, and am sure there are others that can clarify. Correct! But I am not talking about the Arctic re: decreasing/stable moisture, as it is definitely warming & moistening (also due to the loss of albedo); I am referencing land areas that are newly-covered by snow when they usually aren't. I understand that, but I think the moisture problem may exist everywhere or at the very least, in many places other than the Arctic. I will be open minded and wait on other thoughts in that regard though. Open water is a much more effective heat sink than open ground, making it hard for the snow cover to shift the balance. Not much of snow cover survives the summer so all that melt water fully contributes to the "double edge sword effects" mainly river runoff into the arctic, errosion of permafrost, trapping heat in late fall. Unless we start to see buildup of multiyear snow I think the extra cover is not doing much good for the warming. Warmer Arctic --> more evaporation --> more snow fall --> reflects SW radiation in the summer --> cooler Arctic. But we don't see more snow surviving into summer, we see less and less snow cover in the summer - check the Rutgers data or the NOAA snow cover data. More extensive snow cover and thicker snow appears in the winter, when the sun is not shining... no albedo negative feedback. Warmer Arctic with more open water --> more evaporation --> thicker snow on the ice --> insulates the ice from bottom freeze --> thinner ice, melts sooner --> more open water in summer --> reduced albedo = warmer --> more evaporation... and more open water also makes more evaporation --> more snow. Also, thicker snow on land insulates the permafrost, preventing it from radiating away the heat gained during melt season. The top surface of the snow is much colder, but the bottom is warmer, just like a blanket. When the snow melts in spring, the permafrost starts out warmer than usual. Snow falling on open water makes slush, which soon solidifies into solid ice if it's cold enough. If the Arctic ocean surface is a little warmer, and if much heavier snow falls on the water forming a very thick slush layer, it might not be able to freeze solid. Solid ice has a much higher thermal conductivity than water, so a thick slush layer would act as insulation on the bottom of the ice, trapping water in its voids, preventing heat from conducting upwards through the ice as quickly... in addition to the air/snow insulation effect on the top of the ice. This would be consistent with the observations that Arctic ice seems "rotten" and weak. Maybe it has more slush within it than historically. Are we talking about more snow thickness, or more snow extent? only the latter has any albedo effect. I seem to recall that we have positive snow anomalies in winter, and negative in spring. I would not be surprised if the annual net change in albedo times insolation is actually negative. This needs quantification, as it is the whole basis of bbr's hypothesis. As the Younger Dryas has been mentioned - it has a very good explanation unrelated to albedo. When the Laurentide ice sheet retreated, large accumulations of icy meltwater were trapped on land, and periodically discharged into the ocean causing a temporary drop in global temps. From Wikipedia: The prevailing theory is that the Younger Dryas was caused by significant reduction or shutdown of the North Atlantic "Conveyor", which circulates warm tropical waters northward, in response to a sudden influx of fresh water from Lake Agassiz and deglaciation in North America. Geological evidence for such an event is thus far lacking. The global climate would then have become locked into the new state until freezing removed the fresh water "lid" from the north Atlantic Ocean. An alternative theory suggests instead that the jet stream shifted northward in response to the changing topographic forcing of the melting North American ice sheet, bringing more rain to the North Atlantic which freshened the ocean surface enough to slow the thermohaline circulation. For those of you who haven't heard about it, you may be interested in reading about the Ewing-Donn theory (Wikipedia) from the 1950's, which posited that ice ages were caused by this negative feedback of snowfall anomalies. Also read this excellent summary on Spencer Weart's Discovery of Global Warming website that places the theory in historical context. I'll chime in and state the obvious: most of the added snow falls in the winter when there in no insolation to either be absorbed or reflected. So the albedo effect is minimal. One other thing: the melting tundra is sprouting more and more bushes and trees that stick out of the snow. That creates a very big change in albedo, considerably warming areas that are becoming so forested (and 'bushed'), at least when the combination of sun and snow exist there. Thanks TT for making this thread. I agree with this. When talking about albedo the important measure is snow extent. Snow thickness is almost irrelevant. I think snow thickness is relevant in other ways. Snow is an accumulation of excess winter cold that is consumed during spring and summer. Water in the atmosphere during winter accumulates "cold" to the point that it turns to snow and falls to the ground. Without the water in the atmosphere temperatures would have instead dropped to a lower temperature. During spring and summer the cold stored in snow is used up, resulting in a colder air temperatures than without snow and a smoother transition to summer temperatures. As the world warms there is more humidity in the air, thus temperatures rise to convert that water into snow during fall and winter. However the rapid fall of spring snow hints that the accumulation of snow during winter has failed to store enough cold to counteract the ongoing warming. So even when there is more cold accumulated in winter, the snow is melting faster. Judging by the extent measure is not even enough snow to provide a negative feedback in the form of albedo. For the question: Is the increase in snow fall during fall and winter enough to provide a negative feedback in the form of higher albedo? The answer so far seems to be no. As the globe warms it is likely that humidity will increase even more. Maybe it will eventually be enough snow to provide a longer lasting albedo negative albedo feedback? I don't think so because winter temperatures are already significantly higher for most of the NH. More water will just raise the temperature even more. Yes, extent is more important than thickness when it comes to albedo (in that additional thickness gives very little additional albedo beyond a certain point). BUT! Thickness becomes important when considering the rest of your argument, i.e., duration of snowcover during spring/summer, in that if wintertime areas that receive snowcover see much more of it than normal, they will be more prone to retaining their snowcover until later dates than normal. This is very important to albedo and it ultimately results in more extent than normal, it just may take a while to get to this point. For instance: we may be at +1-2M of avg wintertime snow vs. 1990s in some spots in Quebec and Siberia; it may not take more than 1-2 additional meters of wintertime snowfall to begin to really prolong the duration of snowcover in these regions. I think that snow has been melting faster until now (and may continue to do so for some time) as we have only begun unraveling the first component in the see-saw of Arctic sea ice vs. continental snowcover (since the Arctic, despite its failing sea ice, is still at 13.5M KM2). 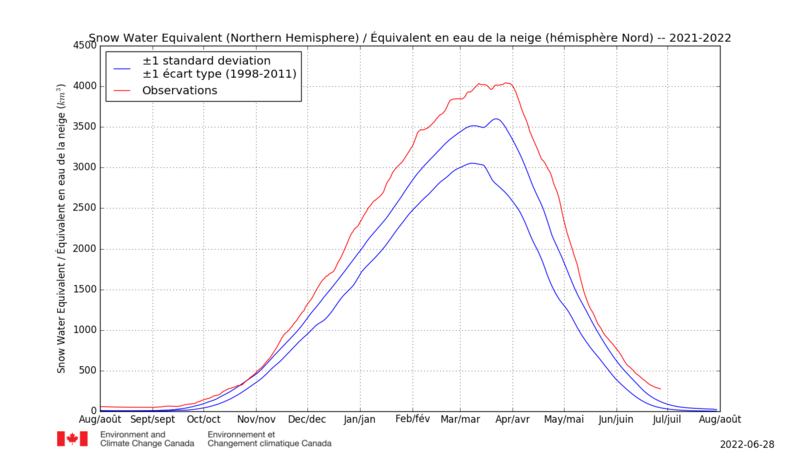 As the Arctic continues to drop, I anticipate a sustained and continued annual rise in NHEM snowcover volume. This comes with token extent increases in winter, but major changes in both fall and spring. We have already seen fall extent anomalies begin to take off in a dramatic fashion -- spring anomalies, IMO, would be next. While extent is fairly normal at the moment, we are *well* beyond +1SD vs normal volume, and probably somewhere between +2 and +3SD (i.e., possibly a record for the modern era! but without data who knows). The Finnish graph exemplifies how the trend in fall is even more dramatic (it discounts mountainous regions). In fact, this past October/November we had roughly *double* the snow/water equivalent of the era of record. In my eyes it would seem that there is a very strong relationship between declining sea ice volume and rising continental snow volumes; in fact, a decent portion of the Arctic sea ice volume we have lost vs. normal is resting on the continents, and adding the ~700KM3 of surplus snow we have back into current sea ice volume produces a total much closer to "normal". This, to me, suggests causation and not correlation. If wintertime extent is fairly normal, then there is currently no albedo anomaly, just extra snow that seems to melt very quickly when spring arrives, therefore gaining no annual anomaly. And since the ocean's albedo anomaly could bring extra summer heat, the nearby conintents could become even warmer than they currently are in summer. Regarding snow surviving in Siberia or Canada, I seem to remember nearly 30oC in Siberia at some point last summer or the one before, maybe the same in Alaska too. Can't build an ice sheet under such conditions. I personally fail to see the possible changes in weather or circulation that could save the continental snow for next year. Or even for enough time to give a significant anomaly. Is there any chart of snow extent anomaly through the year for the last couple of years? Could help quantify my gut feeling. This doesn't augur well with what is actually happening in terms of positive depth anomalies translating into later melt dates. My intuition is that for snowpack of any considerable depth, the insulating capacity of snow will completely dominate any albedo effects. Firstly, albedo has much less of an effect in winter, so positive extent anomalies between October and March are going to be pretty limited. Secondly, any impact albedo will have during the melt season will be mitigated by the fact that melting snow accumulates debris on the surface, and in general will have a substantially lower albedo than fresh snow. When recreating in avalanche terrain, knowing the temperature gradient of the snowpack is important. A rule of thumb often taught is the bottom of the snowpack is 0°C unless you know the ground is permafrost. Places cold enough to have permafrost that get plenty of snow typically won't have it because the snow will provide too effective a blanket for winter temperatures to cool the ground effectively. But to suggest that this insulating effect is two-sided doesn't consider the seasonal dynamics of snowpacks. Loose, low density fresh snow has the best insulating capacity, whereas a dense, water-saturated and isothermal spring snowpack has effectively none, with essentially only the latent heat of fusion and albedo to moderate the warming of the ground. Of course, albedo is meaningless if the snowpack is being rained on, and longwave radiation balance has a very strong effect. A little bit of haze an ambient humidity can mean the difference between a firm spring snowpack and slush. If the increase in snow cover is because of increased moisture over northern landmasses, this change will also have the effect of speeding up melt. Finally, it's worth considering what happens to saturated snowpacks on a slope. In the wintertime, slopes under 30° are generally considered stable. In the spring, however, clear skies are essential to keeping snow on slopes of any significant angle, because without the ability to radiate away heat absorbed during the day, the snowpack loses all cohesion and slides right down to the ground on slopes as little as 15°. This is even more common at higher latitudes because there is less night sky to refreeze the surface. The net effect of this is congruent with observations: deeper snowpacks will not lead to later meltouts because melt is extremely dependent on weather and the same extra moisture bringing increased snowfall in the fall and winter brings overcast skies and rain in the spring. In fact, I would not be surprised to see northern latitudes, especially mountainous regions, to see huge increases in average snowpack depth going along with significantly earlier melt times. So for feedbacks involving depth, we are essentially left with more insulation in the fall and winter, when the warming effect this has will be the greatest, and no albedo anomalies in the spring and summer to offset this. in fact much less land is coverd by snow, i.e. all of nothern europe and big parts of eastern europe remain mostly snowfree or snowpoor as compared to i.e. when i was a child about 55 years ago. taking specific spots that due to warmer and wetter conditions have a bit more snow in some years is not target leading but misleading. i have observed for quite some time that you want to convince us that an ice age lays ahead. ok that's an opinion but so far of IMO (and thats also an opinion LOL) that i won't even enter a discussion. there has never been an ice age at times when i.e. CO levels were so high and still increasing, that alone tells the story but then there is much more that tells a future of warming and not one of cooling (overall, not locally) there will always be local counter effects due to air and water currents as well as shifting vertical air movement areas but the planet earth will get warmer as long as we add heat and heat containing factors. of course the process will not be linear at all times but persistent in the long run. in fact much less land is coverd by snow, i.e. all of nothern europe and big parts of eastern europe remain mostly snowfree or snowpoor as compared to i.e. when i was a child about 55 years ago. ^I am speaking hemispherically re: charts/etc. Some regions see more warmth, some more cold. Europe has been warmer in general so far and not that snowy. Alas. "i have observed for quite some time that you want to convince us that an ice age lays ahead. ok that's an opinion but so far of IMO (and thats also an opinion LOL) that i won't even enter a discussion. there has never been an ice age at times when i.e. CO levels were so high and still increasing, that alone tells the story but then there is much more that tells a future of warming and not one of cooling (overall, not locally) there will always be local counter effects due to air and water currents as well as shifting vertical air movement areas but the planet earth will get warmer as long as we add heat and heat containing factors. of course the process will not be linear at all times but persistent in the long run." I am not trying to convince anyone an Ice Age lays ahead, merely stating that we should not ignore feedbacks and the potential for negative ones is equal to positive ones despite AGW (IMO). Our dataset is extremely limited but what we *do* know is that when the Earth is in an Ice Age, it generally does not warm past a certain point without flipping back into a colder state. Where your post is specifically wrong is where you say "there has never been an ice age at times when i.e. CO levels were so high." We still have ice sheets covering Greenland and Antarctica which means that we actually *are* still in an Ice Age, so by default that statement is incorrect. Whether we exit the current Ice Age or plunge back into the depths of the freezer is the question facing humanity today. Given recent history of the past few million years, Younger Dryas etc argue we are more likely to pivot back to cold versus lose all the ice on Greenland/Antarctica, though you *are* correct that we have (seemingly) never had an ice age at a time when CO2 levels were so high as they are today, which means that either direction is possible. Also: I am actually pretty sure Eastern Europe has been fairly cold/snowy this winter? On a related note, I am wondering if a mechanism to explain the European warmth can be found in the ice-free Kara/Barentz. These promote warm air rising into the Arctic as well as into Greenland, while simultaneously encouraging the cold Arctic/Greenland airmasses to drop south on the backside of these intrusions. This usually happens either through Quebec or to the east of Greenland. In either case, as the airmasses plunge south they are now seemingly heading towards Spain and Morocco/Algeria, (or alternately S through Scandi. into Eastern Europe) where the former have allowed the Atlas Mountains to be very snowy relative to normal which promotes cold and snow over the rest of NRN Africa. These airmasses get "stuck" south of the very warm Mediterranean waters and travel east, with Turkey and Iran lying in the path of both Arctic Express trains, translating into the extreme cold and snow anomalies that we are now seeing in both of those regions. That leaves much of continental Europe relatively warm as it is stuck in the "in between" of airmasses plunging to the west and to the east, with the ones coming from the west facing the natural heat barrier of the Mediterranean, which pushes them south. Hopefully this makes some sense?? It also explains why we see the Sahara turn into a wet environment every couple thousand years, coincident with +++snowpack in the mountains of Algeria and Morocco. We've seen the data presented in this thread that shows a decline in spring snow cover extent at the same time as an increase in winter snow mass. So the only remaining question is whether we think it is possible that a future increase in winter snow mass might overwhelm the current trend in spring snow extent to lead to an increase in spring snow extent, and thus a cooling feedback. Well, there would have to be a lot of extra snow to survive the extra warmth that exists in spring, that has lead to the observed decline in spring snow cover extent. The other things that strikes me about this is that the proposed feedback cuts against itself. The warmer world leads to extra snowfall, the extra snowfall survives into spring/summer to cause an albedo feedback, which leads to cooling, which reduces winter snowfall, and so carbon dioxide reasserts itself as the dominant climate driver. In order to overcome the carbon dioxide warming effect the albedo effect would have to not just be stronger than last year, but it would have to be stronger than in the 1950s, when spring snow cover extent was considerably greater than now, when the albedo effect was not strong enough to stop carbon dioxide from warming the planet and reducing spring snow cover extent. I could, perhaps, envisage a major one-off cooling event managing to create a sufficiently large knock to the climate system to increase snow cover extent such that an albedo feedback kicked in... were it not for the fact that we already had a couple of such events over the last two centuries or so, with the eruptions of Tambora and Krakatoa in 1815 and 1883, respectively. These large volcanoes did cause significant cooling for several years, cooling that would, I presume, have increased snow cover extent, particularly in spring when the generally lower temperatures would have delayed the spring melt, but even they were not strong enough to kick the climate into a cooling feedback loop. It is possible that the orbital parameters are a bit different now, perhaps more conducive to this feedback, with less solar insolation in spring - the typical way that the Milankovitch Cycle is though to trigger ice ages. But I doubt it. This is an interesting idea, but I think that the relatively recent volcanic eruptions demonstrate that the snow cover albedo feedback is not strong enough to create a cooling to overwhelm the warming effect from greenhouse gases if, somehow, extra winter snow were suddenly able to translate into increased spring snow cover extent. This map illustrates the high ground south of the Arctic where any evaporation from the warming ocean is likely to precipitate out as snow. For me the most at risk area is the uplands of Eastern Siberia and Mongolia, but you have to allow that anywhere from northern Spain to the Chukchi are possiblities. My own thinking is that until Laptev is ice free in November and December we have no idea how much snow a random weather event can drop here or how persistent it will be, but I suspect it will rapidly expand to the point where the northern slopes will carry permanent snow. IF that happens the climate in Siberia will reverse being much colder in the southern uplands and more like permanent springtime by the ocean, and in time an enduring cold wind falling out of the mountains flowing east over China. I don't know for certain that something like this will happen, but I think it is reasonable that it could possibly. Regional climate transitions are appearing to have at least started in many places, and therefore in one way bbr could have a valid theory. I can't see it happening globally or even hemisphere-wise, but regionally, maybe. Let's also not forget the rather obvious fact that there is more snow in the winter in the Arctic because there is more water vapor in the air in the Arctic now. The more snow there is indicates the more vapor there is. Water vapor is a very powerful GHG, of course. And GHGs have their strongest effects in the winter (or at night, which is the same thing in the Arctic). So I'm guessing it's basically mathematically impossible for whatever albedo damping (negative) feedback increased snow may have to beat out the exacerbating (positive) feedback of the very water vapor that has to be there to create said snow. But maybe I'm missing something somewhere? "...feedbacks and the potential for negative ones is equal to positive ones despite AGW (IMO). ...when the Earth is in an Ice Age, it generally does not warm past a certain point without flipping back into a colder state." This strikes me as quite wrong or at least misleading. Perhaps you could present any studies that suggest that our current (and probable future) anthropogenic GHG forcing plus the very many large exacerbating feedbacks are balanced out by damping feedbacks on any time scale shorter than tens of thousands of years, at least. And the earth during this relatively cool last few million years has has been 'flipping back to a colder state' because of Milankovich cycles, not primarily because of powerful damping feedbacks kicking in. Again, if you have studies that show that it is feedbacks and not Milankovich orbital wobbles that are the prime trigger for periods of increased glaciation, please present them. "The timing of melt onset affects the surface energy uptake throughout the melt season. Yet the processes triggering melt and causing its large interannual variability are not well understood. Here we show that melt onset over Arctic sea ice is initiated by positive anomalies of water vapor, clouds, and air temperatures that increase the downwelling longwave radiation (LWD) to the surface. The earlier melt onset occurs; the stronger are these anomalies. Downwelling shortwave radiation (SWD) is smaller than usual at melt onset, indicating that melt is not triggered by SWD. When melt occurs early, an anomalously opaque atmosphere with positive LWD anomalies preconditions the surface for weeks preceding melt. In contrast, when melt begins late, clearer than usual conditions are evident prior to melt. Hence, atmospheric processes are imperative for melt onset. It is also found that spring LWD increased during recent decades, consistent with trends toward an earlier melt onset." Climate denial garbage can, imho. The way I see it is that thicker snow insulates more at night/winter, producing even lower surface temperatures (particularly over land, as the sea-ice is forming later/is thinner than in earlier years). Therefore less energy is being radiated from the underlying surfaces. But when the seasons shift the warming climate results in melt starting earlier and the "snow-off" dates are getting earlier in spite of the thicker snow. This then contributes feed-back for increasing the Arctic warming. I have not seen thicker snow = more persistant snow. Even in the Arctic 2m ice can melt out over the summer, and that is a lot of snow equivalent. Even at higher altitudes snow-lines are retreating up mountains and glaciers so warming is beating cooling. Garbage can is too small. You're gonna need a dumpster for that. I have not denied anything, and saying ignorant things/attacking different points of view when I have clearly said *I could be very wrong and I would like evidence* over and over again is how you end up with an ignorant and uninformed perspective. I am 100% on board with AGW/climate change and the fact that you cannot consider that it could have unforeseen consequences that could be even worse than what happens in a warming world shows you are the denier, not me. So far, we have not seen snow persist through summer in any of these northern locations -- no disagreement there. I suspect the tipping point may start gradually but begins once we see our first summer where snow *doesn't* melt at all locations that normally see this happen. This is currently very difficult, but how much more additional snow do we need in parts of Siberia and Quebec for this to be a more realistic possibility? Additionally, one must consider the regional forcings that will soon dominate climate in these regions. While the Arctic continues to lose volume, Hudson Bay will likely remain relatively steady given its surroundings as well as the fact that it has always melted out every year. What happens when the Arctic Ocean is mostly ice-free in June/July but Hudson Bay is not? I suspect that would encourage longer durations of colder airmasses across much of Canada (especially Quebec) through the summer. And consequently, that also increases the potential for certain regions to begin building snowcover through spring and at least the early part of summer, at least relative to the 20th century. bbr2314, did you have a look at the Ewing-Donn theory yet, and why it was rejected ultimately? I've read the links but I missed the part about why it was rejected, can you re-link to the specific bits? Appreciate it! Also I think Ewing-Donn misses the component of AMOC shutdown/freshwater release from Greenland/Antarctica. Ewing and Donn worked to patch up the holes in their theory by invoking additional phenomena, and for a while many scientists found the idea intriguing, even partly plausible. But ultimately the scheme won no more credence than most other theories of the ice ages. (51) "Your initial idea was truly a great one," a colleague wrote Ewing years later, "...a beautiful idea which just didn't stand the test of time." The problem you are missing is that the trend is in the opposite direction, with reductions in snow cover extent in spring. So it cannot happen gradually, because it is already happening rapidly in the other direction. Your hypothesis clearly requires a large shock in addition to the observed extra winter snow, but as I have argued past large volcanoes have not been large enough. It's also worth noting that the Younger Dryas cooling was ultimately a temporary reaction to a freshwater injection to the north Atlantic - it too was not able to overcome the boundary forcing. You presented an interesting idea, but a lot of evidence contrary to that idea has been presented and you seem to be ignoring it. In my understanding of the climate system I have not ruled out yet that rapid global warming may lead to rapid global cooling. I think it will take rapid Greenland/Antarctic melt followed by a sharp increase in volcanism. Under that scenario, the albedo and aerosol changes might be enough to cause a global winter lasting anywhere from years to decades. But I'm talking about ridiculous amounts of melt and an equally ridiculous increase in volcanism. Large positive snow anomalies in the Fall and early Winter (driven, at least in part, by wide expanses of open water in the Arctic) and dramatic negative anomalies in the early Spring (caused by a rapidly warming planet) is the worst possible scenario as the vast stretches of permafrost are insulated from the winter cold and then subjected to a lengthening warm season. The changes occurring are accelerating. I guess that is like a one-two punch. And the permafrost is melting, like crazy fast. Nobody could have foreseen how fast it is melting. What caused the largest glaciation event in Earth’s history, known as ‘snowball Earth’? Geologists and climate scientists have been searching for the answer for years but the root cause of the phenomenon remains elusive. Now, Harvard University researchers have a new hypothesis about what caused the runaway glaciation that covered the Earth pole-to-pole in ice. Researchers have pinpointed the start of what’s known as the Sturtian snowball Earth event to about 717 million years ago — give or take a few 100,000 years. At around that time, a huge volcanic event devastated an area from present day Alaska to Greenland. “Cooling from aerosols doesn’t have to freeze the whole planet; it just has to drive the ice to a critical latitude. Then the ice does the rest,” said Macdonald. That's looking a long way out, I'm thinking not of global cooling or an ice age, although the eventual distibution of ice masses may bare some resemblance, but more of a mechanism that emerges to halt a runaway greenhouse effect. That means increased evaporation from a warmer Arctic, precipitating out somewhere high enough and remote enough from any ocean to survive summer melt, and with minimal change of elevation between there and the sea, so the Altai mountains/Mongolia fit the bill in Eurasia, and southwest of Hudson going towards Montana in the Americas. I know too little about atmospherics to think properly about this, but it seems to me if you add the latent heat of evaporation to that of freezing/melting thats a way of lifting vast amounts of energy from the Arctic and dumping it far to the south high up in the[now dry] atmosphere, plus if this kicks off as a random but powerful weather event the transformation of the vapour to solid, and consequent loss of volume, could be self reinforcing. Once established, and it may take a number of false starts, it's possible that it would create it's own weather systems. I think you have hit the nail on the head 100% re: what I am attempting to describe. I fully acknowledge everyone's comments re: current feedbacks and the current decline in spring snowcover. That is not what I am debating, though it is undeniable that spring extent has fallen in recent years. However, if one were looking at the data back in the 60s/70s (if we had the data then), one may have come to the same conclusion re: fall snowcover then (irreversible decline). My point is not that this is not happening today -- it is that the mechanism resulting in increasing fall/wintertime snowcover will soon overwhelm spring/summer snowcover as well, even if it may take another 5-10 years to kick into gear. I suspect we are already at the bottom of the trendline re: spring snowcover (again, could be wrong), and that as the situation up north continues to unravel, we will see a rapid uptick beginning. Already, this year seems to be bucking the trendline in spite of the record warmth. Perhaps we aren't +1SD in extent, but we are within range of normal, and in terms of volume, we are still *way* above normal. RE: Neven & the comments on Ewing-Donn -- to my eyes, it still seems to be plausible? The comments afterwards seem to me to indicate that we still do not fully understand how ice ages come about, so it certainly does not seem to have been discounted as a plausibility as we head into the future (though perhaps in the past it was not a mechanism for change, that does not mean it cannot be in the future given our unprecedented situation re: GHG emissions simultaneous with an ongoing albeit seemingly waning ice age). On its own, Ewing-Donn may be merely plausible, but I believe they ignored the impacts of freshwater melt/AMOC shutdown. Combining the theory of Ewing-Donn with the findings of Hansen et al and their anticipated cooling based on AMOC shutdown and Antarctic melt *alone*, leads me to believe that if anything, Hansen's anomalies may be underestimating the impact of the freshwater melt. When you join these two theories together, I believe we can make much better sense of ice ages. That is also not to say Milankovich cycles are unimportant -- clearly, they matter -- but we are currently in a situation where both human and natural forcings are at a seemingly unprecedented head-to-head battle that, IMO, can easily overwhelm the relatively minimal changes in solar forcings that have previously led to climactic changes (i.e., in lieu of a massive asteroid impact or supervolcano, humans are the confounding atmospheric variable). ...in the midst of all the doom and gloom I have found a tidbit of relatively good news: despite his death (RIP and thank you for all the wonderful contributions), the efforts of Andrew Slater continue to be available on his website, and it seems that at least the snow component continues to update. He may be gone but he will not be forgotten, and the latest charts from his website certainly speak to the prospects of glaciers in California -- in fact across almost the entirety of the west, snow-water-equivalent this year is #1 for the date! RE: what it takes for snow to make it through the summer, I have found the below with regards to glaciers in Sweden. But that's where the problem is, right? The temperatures will not lower in the foreseeable future. My point is not that this is not happening today -- it is that the mechanism resulting in increasing fall/wintertime snowcover will soon overwhelm spring/summer snowcover as well, even if it may take another 5-10 years to kick into gear. The mechanism, ie global warming via CO2 forcing, is going to continue to increase as well and overwhelm fall/wintertime snowcover. At some point snow will turn into rain.